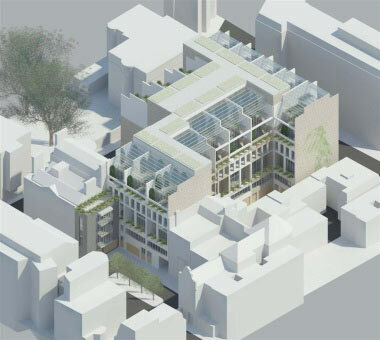 The proposal for Audley Square is inspired by the historic notion of the town mansion houses, which were built in London and specifically in this part of Mayfair during the Georgian period concluding in the Edwardian era. The notion of the Georgian/Edwardian town mansion is used only to create magnificent terraced houses, which cover the site built on similar proportions to this historic inspiration. The proposed mansion terraced houses will combine the character and materials of the Conservation Area but in contemporary design with state of the art technology. Each building will be similar in plan form with an overall width size on average of 8.4m by a plan depth of 16.5m. Each mansion townhouse will comprise a grand entrance lobby at ground floor leading to a large lift and grand staircase ascending through the building at the rear of the plan form. Including a full roof garden terrace area with a retractable roof allowing the roof gardens to be an enclosed winter garden during adverse weather conditions. Each floor has balconies increasing in size on the upper floors. Each building will have 2 basements comprising screening room, gymnasium, wine cellar, swimming pool of on average of 6 x 8 metres with sauna, services and plant.